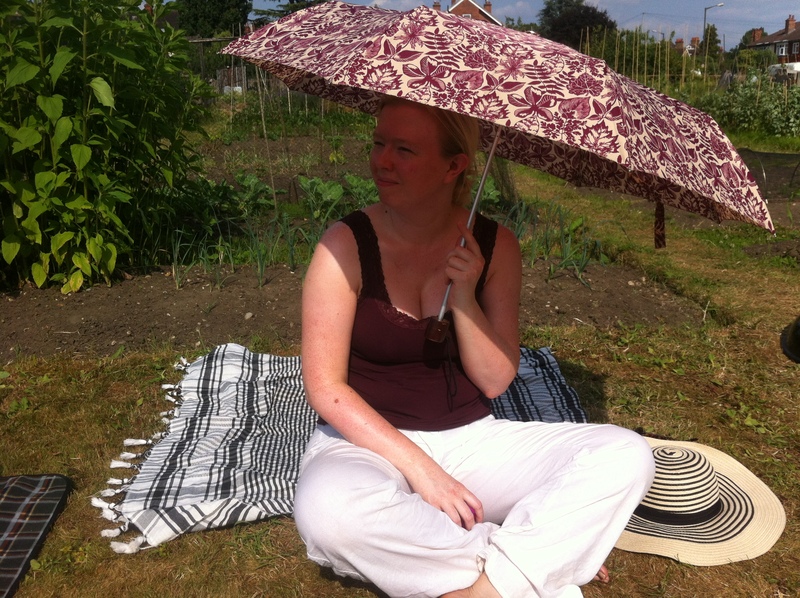 August has been a busy month, clearly not due to extensive blogging, but gardening in general has been chugging along.Highly unusual for August but this has been quite the summer. I’ve been doing quite well keeping up with the plot, squeezing in time where and when I can. It’s work that’s eating up my time, my regular clients included but also a week was spent in Oxford installing thousands of plants in a new build project. 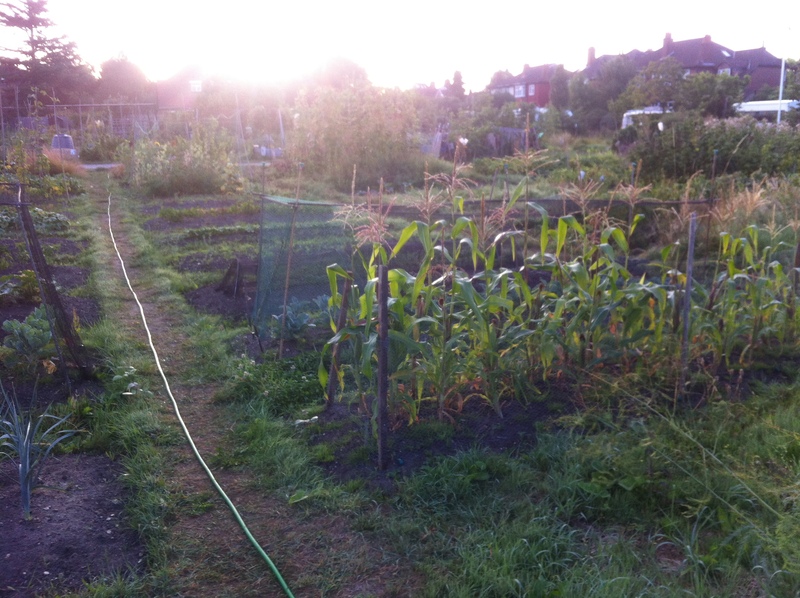 My usual routine in the week is to stop by the plot after work, do a bit of weeding and a lot of watering. Occasionally, harvesting as well. I always stop by there with the intent of being there for only an hour or so, but I often end up coming home as the sun is setting and find Scott has had dinner already. That’s always the way, isn’t it? I’ve actually resorted to setting a timer on my phone to keep track of time… I also use the limitation that I’m only allowed to weed three buckets worth/two beds/one wheelbarrow load of weeds maximum. I always cheat. 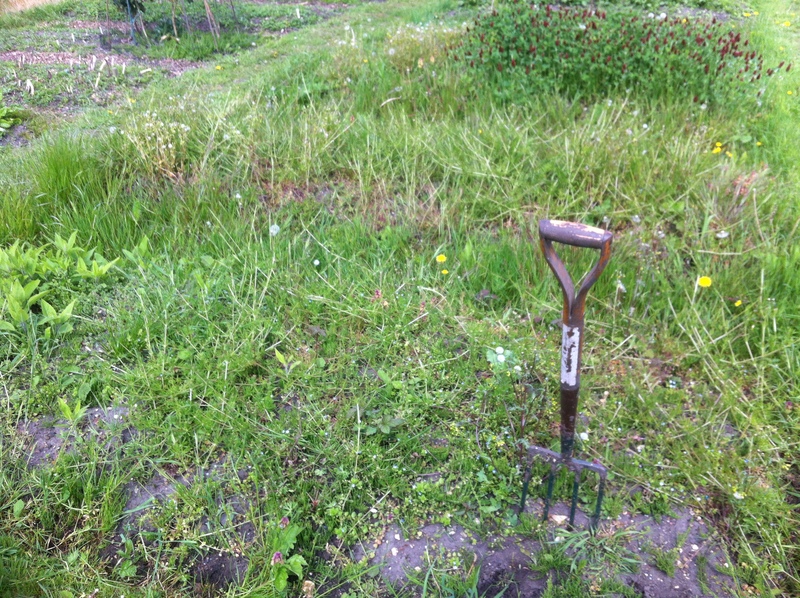 When we started re-organising the plot back in November 2011, we marked out a small lawn area next to the herb beds. Scott did the Man Thing; levelling, adding top dress and seeding the area. Over a year on, it’s now a great patch to stretch out on after a hard morning of weeding. 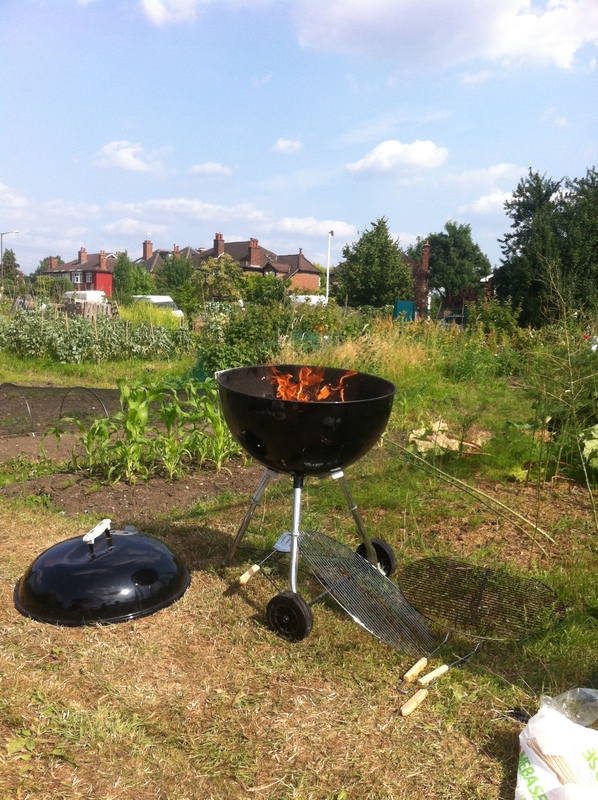 A lovely charcoal BBQ was donated to us earlier this year and last weekend we finally got it fired up. We gathered with our friends; Lindsey, Dan and Jen for a slap up meal in 30C weather. We stayed for several hours and were all lovely and pink by the end of the day. Our next allotment purchase will likely be one of those cheap pop-up marquees from Argos. Still not quite prepared for this proper summer weather! Jen & Dan say hi! 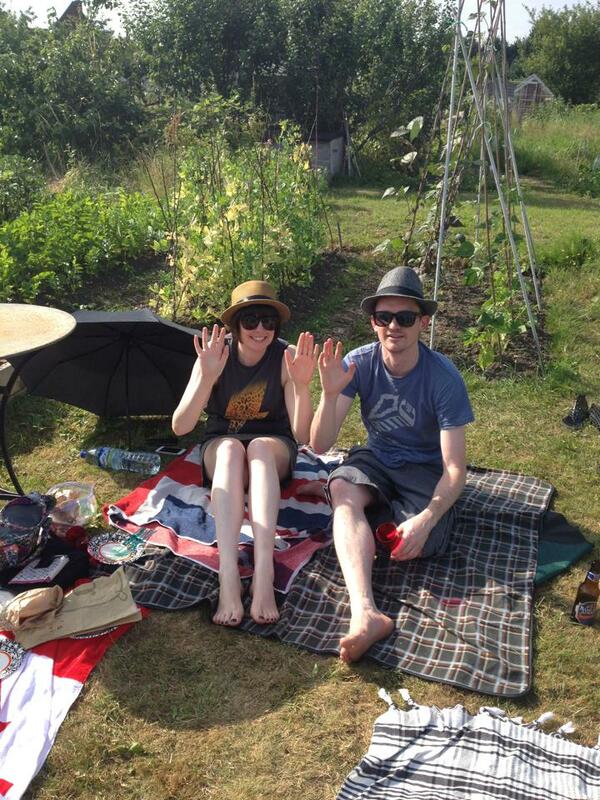 Still, despite the heat, we managed to pack two bottles of chilled Prosecco with us. Made even more delicious by the addition of strawberries and raspberries picked right there and then. Here’s hoping the weather keeps up and we can do it again this weekend. 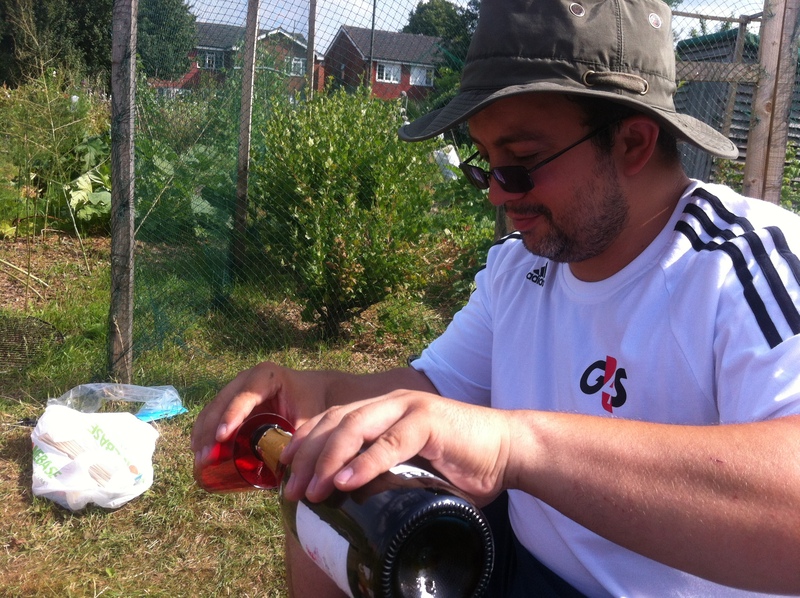 It’s a whole other aspect of the allotment to enjoy, the joy of sharing it with people. 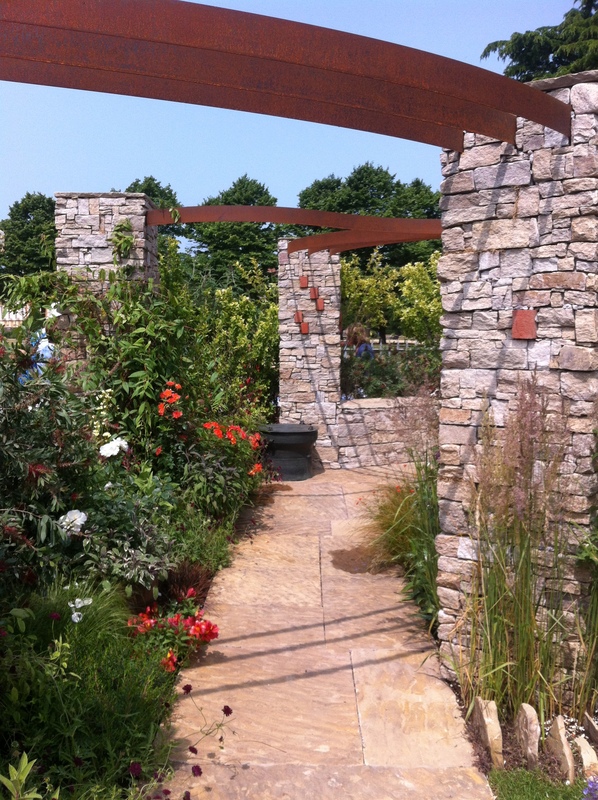 Took the day off work on Friday to head off to the RHS Hampton Court Flower Show. Yes, I took time off from tending plants to go… and look at plants. When you love what you do, this is what happens. I also like the show at Hampton Court much more than Chelsea, which tends to turn into an endless mass of people elbowing you in the sides. The little old ladies being the worst perpetrators. I also have a soft spot for Hampton Court Palace as I spent a blissful year there doing my horticultural/ garden design training. Nice to be back in my old stomping grounds. Scott came along quite willingly and we had a good wander about, sampling gin, foods, and possibly more gin in the ‘Growing Tastes’ tent. We also picked up some more seed garlic from The Garlic Farm, which will go in the ground in a couple of months. Scott acted as my own personal plant attendant when I left him to nap in a shady spot while I bought plants. I generally make a rule not to buy things at flower shows, things are often available elsewhere and for much cheaper. 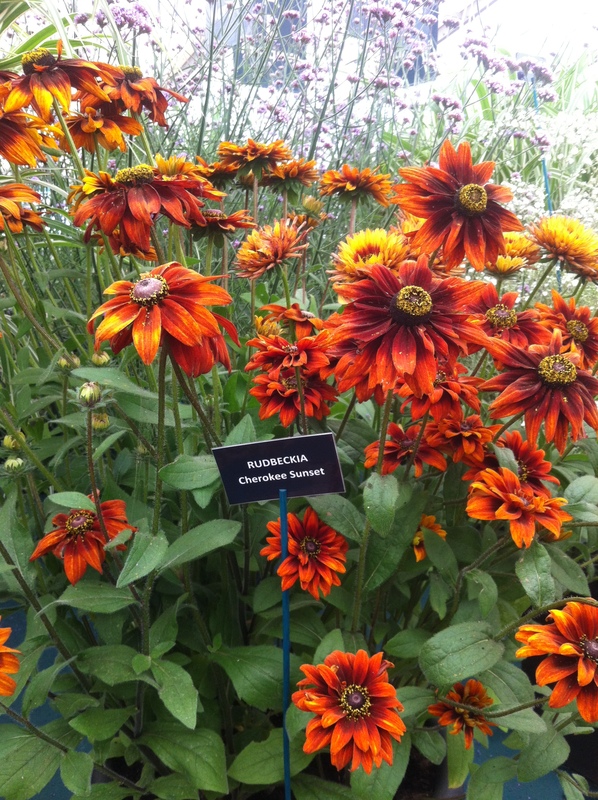 I try and confine myself to taking photos of plants to help me remember names of varieties. With the ornamental beds finally clear and under control (I’m making this sound like an advert for zit cream), I would really like to fill the beds with mix of perennials. My impulse purchases that day were a few Salvia patens with stunning blue flowers and several Cosmos atrosanguineus (Chocolate Cosmos) with their lovely cocoa scent. Neither are particularly hardy, but I do love them. 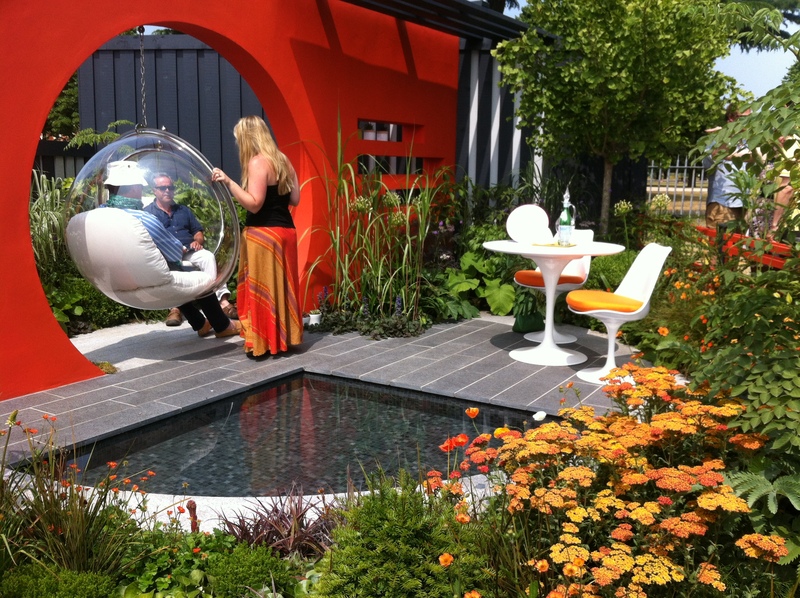 I did also see lots of lovely orange Achillea millefolium in the show gardens this year, so I’ll add them to my wish list. Lovely orange Achillea in the foreground. Another long overdue post, but we’ve been busy and summer has finally arrived. Working as a professional gardener has kept me extremely busy and I’ve been heading to the plot as much as I can to keep things ticking along there. While there have been a few spits and spats of rain, my main job has been keeping everything watered. With the late start this spring, we have lots of seedlings and young plants coming along right now. We’re very much a month behind compared to last year, but I’m hopeful this warm weather will continue on. 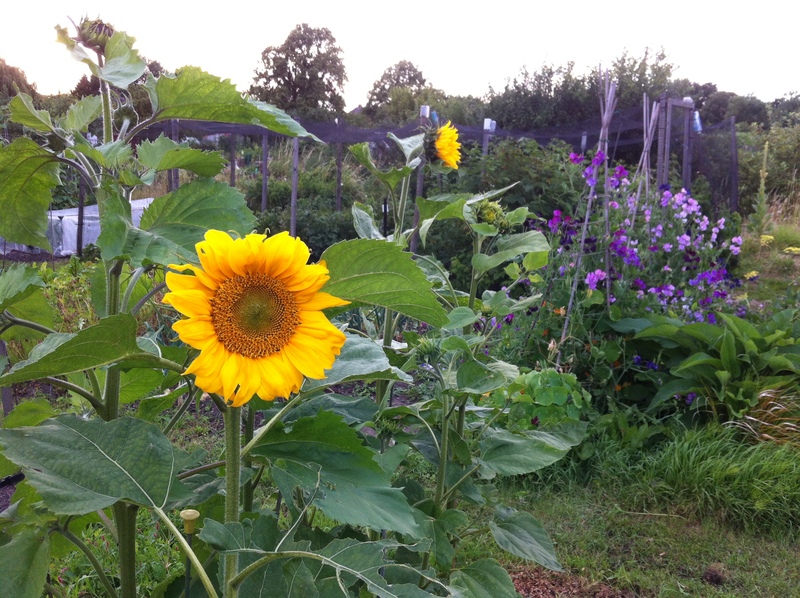 One area of the allotment that’s blowing our socks off right now is the fruit cage. Despite the late start, all the plants are fruiting beautifully. 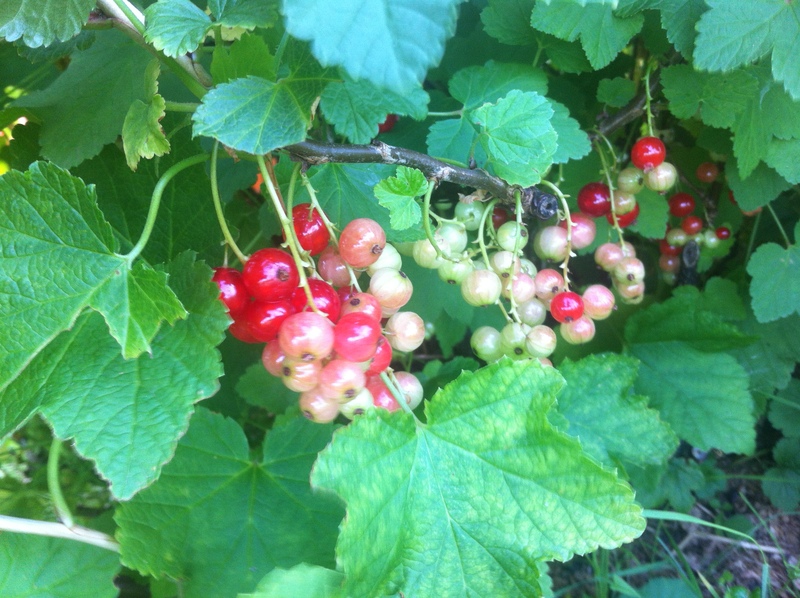 Both the gooseberry and currant shrubs are laden with fruit. The raspberries are forming up nicely. Just having to keep up with trimming the grass in and around it really. For no other reason than keeping the b*****d slug and snail population in check. Red currants colouring up nicely. 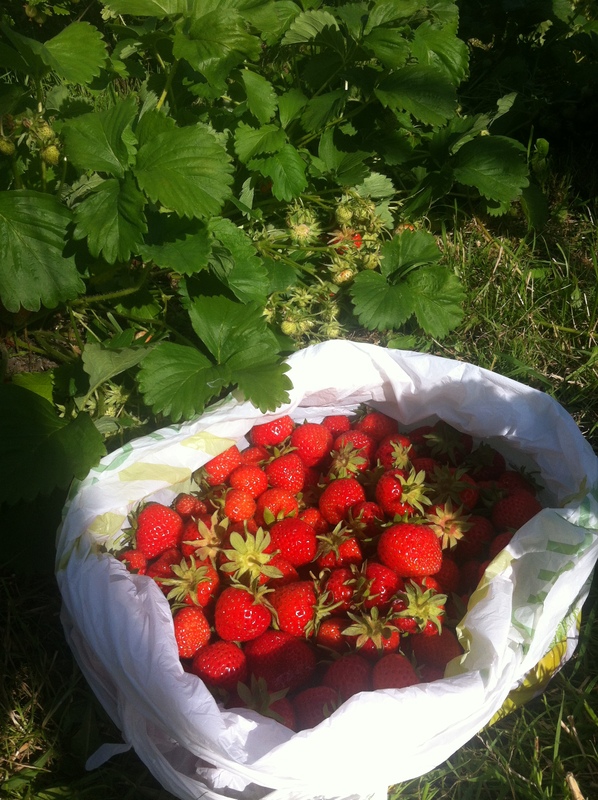 We built the fruit cage last summer and it has truly paid dividends. Simon did a fantastic job building the frame work, it’s sturdy and has plenty of space to move around in. Which is especially important as I am rather freakishly tall. Getting the netting, bought cheaply on eBay, was a bit off a faff to get on. When I say faff, it means I ended up using language that would have made a sailor blush. I was chatting to someone late last year and she commented on the lovely new fruit cage, “it’s always worth putting in the effort to build one of those. You really have no idea how much of your crop is lost to the birds until you build one.” Wise, wise words. *Apologies to those that oppose the use of slug pellets, but they do bloody work and I can’t bear to let all that hard work go into feeding and already exploding mollusc population. It’s been the coldest spring in thirty years, at least that’s what the gang on Springwatch say and, hey, they know best. So why do I feel like I’m running behind this spring? I really didn’t do much during the early May long weekend, I pretty much worked the entire weekend. We spent a lovely weekend away the following weekend, then I worked the weekend after that… However, I was determined to get stuck in this long weekend. I would have spent the whole weekend on the allotment, but the bathroom mildew needed bleaching. Still, enough moaning, Scott and I headed down today to plant out our tomatoes, cucumbers and peppers. The forecast is less than stellar for the next couple days, but the plants were starting to take over the flat. A few were started as plugs I had ordered and others as potted plants. I did do everything from seed last year, but these plants have gotten a far better start and are much more robust looking.However, I did lose several plants last year to the cold, so we’ve protected these as best we can. 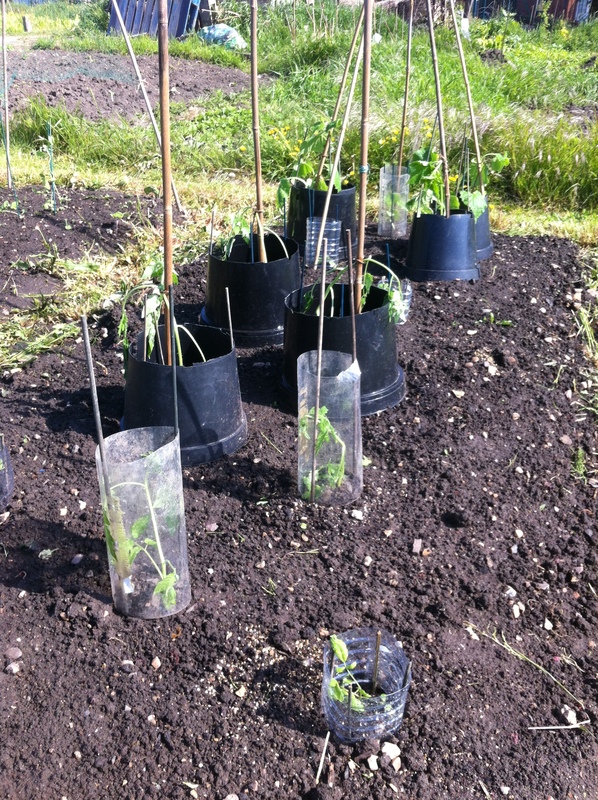 I really should build some sort of mobile polytunnel thing, but chopped up plastic pots and bottles will have to do for now. I will be making after-work visits to check on them! We still need to continue our battle against the weeds. Despite the seemingly cold weather, the grass has been growing at an astounding rate. Simon whacked down a massive amount recently with a strimmer, which is great. 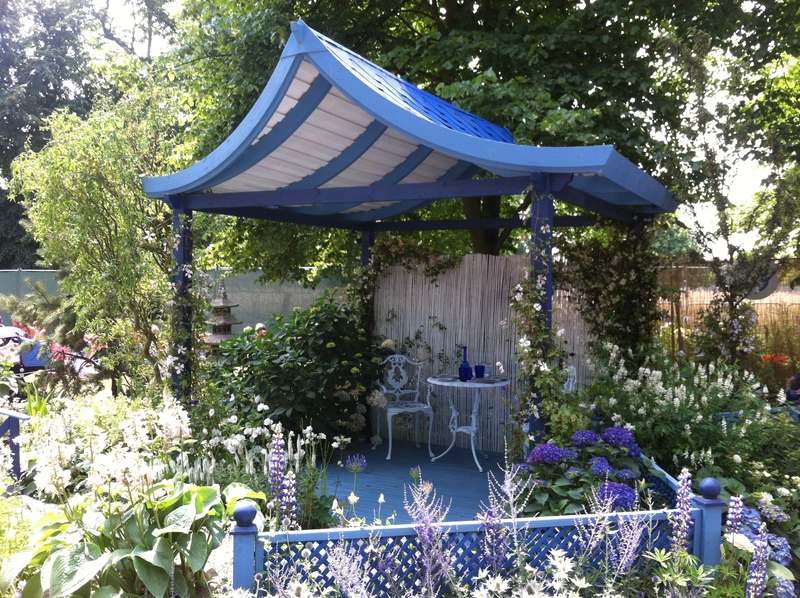 I’ve already done the fruit cage once, but you wouldn’t know it looking at it today. We’re slowly working our way through clearing the beds and getting things into the ground. Plug plants are all in now, but there’s plenty of seeds that still need direct sowing. A few seedlings are making their way fine so far, but time is ticking on. I really hope this slow start spring means we’ll be having a hot summer and autumn. If I can get the rest into the ground soon, warmer weather would mean catching up. Too much to ask of the British weather? I suspect so, but we continue on anyway and will just have to take our chances. I’m here, I’m alive and doing a happy dance in the sunshine. Even the odd downpour hasn’t, ahem, dampened my excitement. Here’s hoping it lasts! Work has been incredibly busy for me these last couple of weeks. My client’s gardens are finally taking off and I’ve been doing lots of big planting projects. 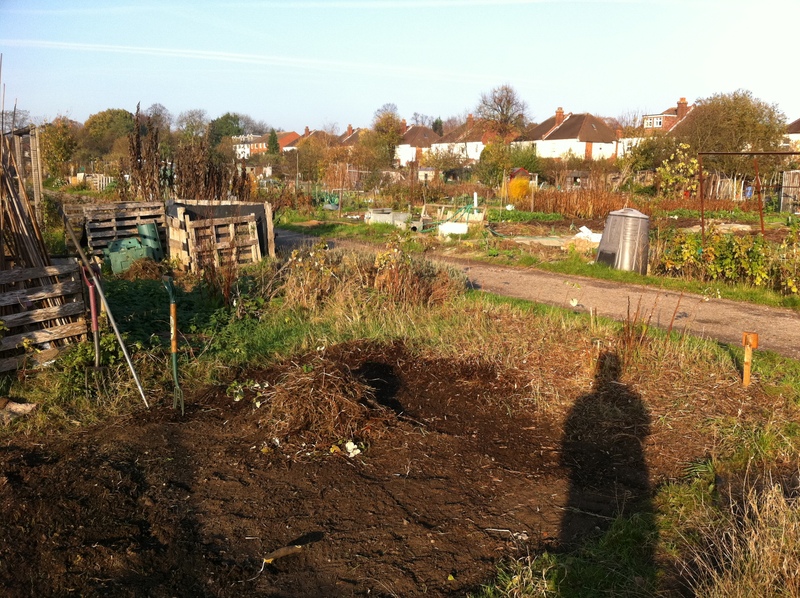 Truthfully, it’s left me quite exhausted, resulting in short visits to the allotment and minimal blogging. It really feels like we’ve hardly done anything yet, but a few things are already going. 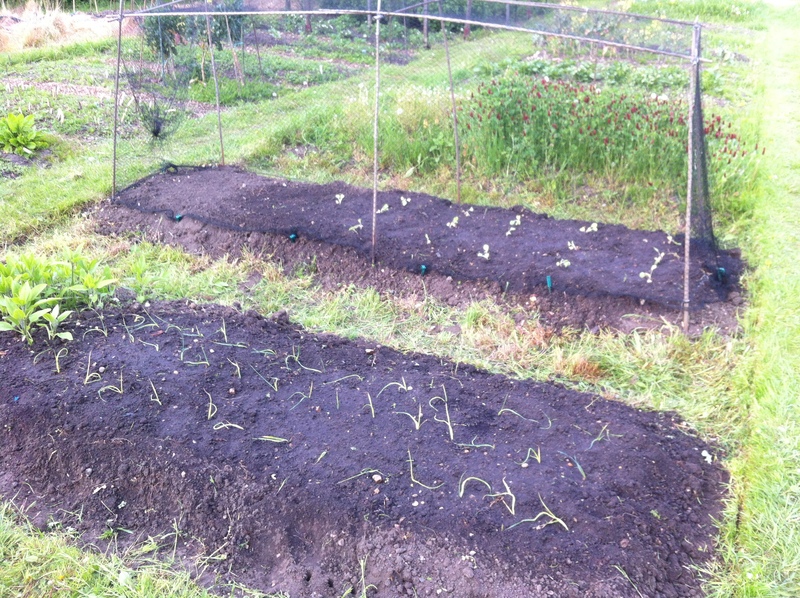 The potatoes and onions are in, as are lots of summer bulbs have been planting. Seeds for direct sowing are all sorted and ready to go, but other than that, it’s been quiet. Last weekend, with the warmer weather, we made a proper jump forward though. We have a small bed set aside for herbs, but last year our herb crops were a bust. Other than a small sage shrub and a few terragon plants, that was pretty much it. Anything started from seed never managed to get started. My theory is that, unlike our mounded veg beds, this bed was ground-level and got too water logged to allow herbs to flourish. I saved a fair amount of scrap lumber from work projects and we constructed a raised herb bed. 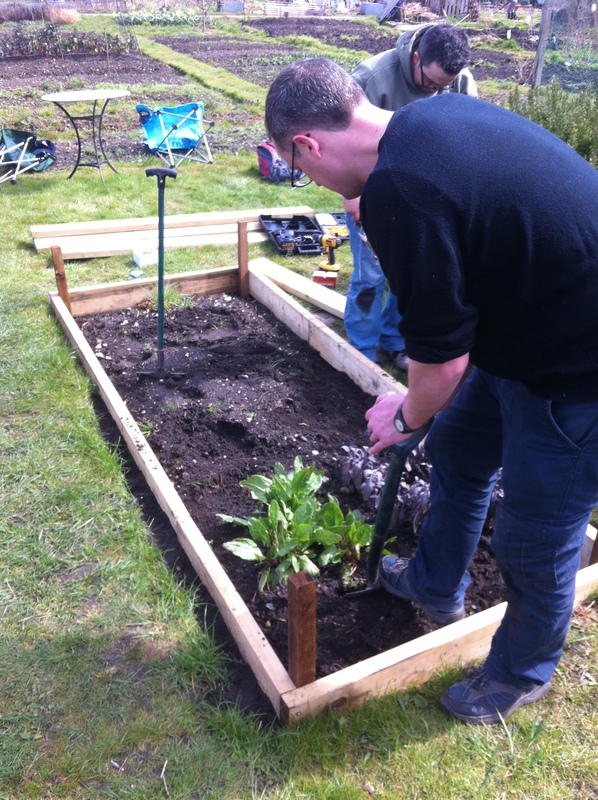 We did look into making all our beds into raised beds, but we worked out that even with the cheapest lumber, it was going to set us back at least £400. We decided that we’d rather spend that kind of money on a second shed. Mounding the beds was a compromise, but has worked just as well. I’ll admit, having neat, tidy, perfectly sized and spaced beds appeals deeply to my sense of aesthetics, but such is life. I’ll just have to derive satisfaction from the tidiness of our herb garden instead. This weekend is not so nearly ambitious, but I’m hoping to finish weeding out the last few beds and to get the plot looking it’s best. I might even give our recently donated BBQ a clean. If the weather continues as it does, we’ll be needing that soon. I feel like I’m being quite lazy this spring, as it seem we haven’t spent much time on the plot this month. Of course, my decision to buy in many of my plants has meant our flat isn’t awash in tiny seedlings this year. Also, given the recent weather, I’m quite happy that there isn’t anything that urgently needs doing. It’s given me far more time to make plans and work on other parts of the plot. The most neglected section was probably the ornamental beds at the top of the plot and this year I’m determined to make something of them. 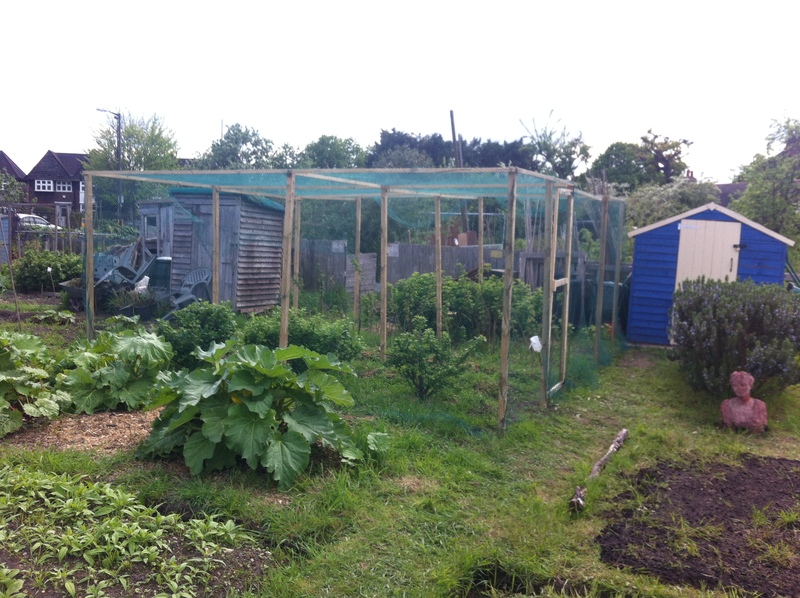 Last year we cleared the top area and moved the raspberry canes down into the fruit cage. These beds are right next to the access road that cuts through the allotment site and is quite close to the main gates. We get lots of passers-by, and lots of hellos as well, but in years past Simon noticed that these raspberry plants never produced fruit. We had a slight hunch that fruit theft wasn’t entirely down to birds, so we decided to move the more tempting fruit to the far end of our plot. The first stages of clearing the ornamental beds last winter. In the late autumn, we planted spring bulbs galore and have done so again last autumn. The daffodils from the first year have returned in abundance, as daffodils often do. 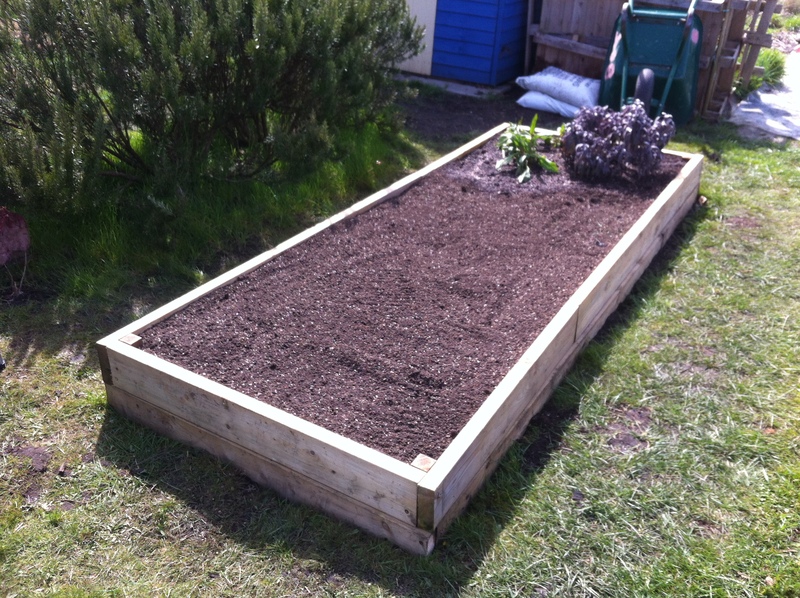 The tulips last spring were a bit stunted, so this year I’ve mulched the beds with our lovely compost we produced. The trial beds of tulips are coming on well too, I do love having fresh cut flowers in the house when ever possible, especially in the early spring. 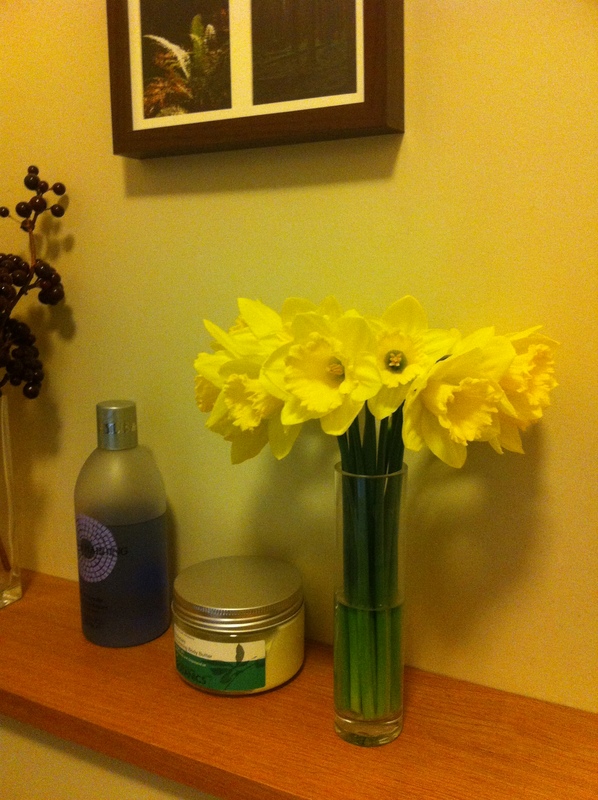 Fresh Daffodils in the house. Last year by the summer however, the beds had become a fairly weedy mess. 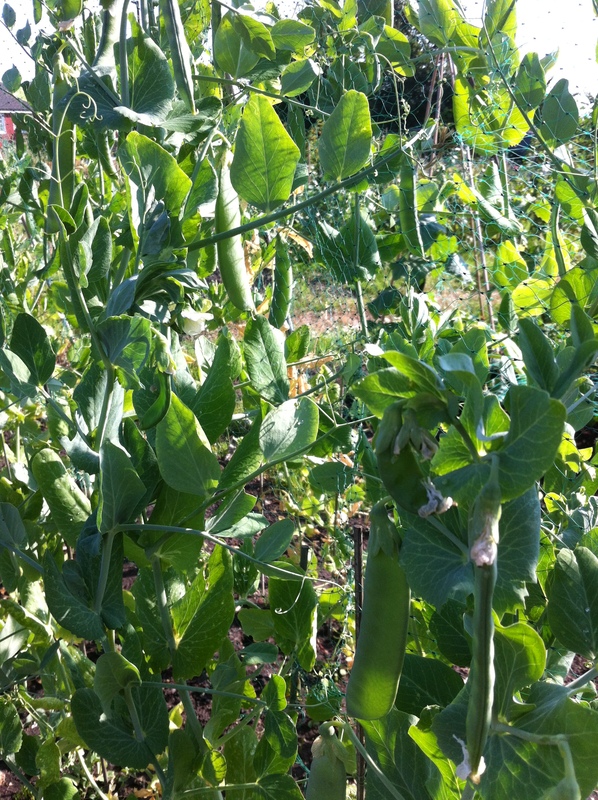 Other than the sunflowers and sweet peas, the beds we’re really not looking like much. I had attempted to sow some wild flower seeds, but they never really took. So in the autumn, I cleared most things out in an attempt to start over and added a few perennials such as Japanese anemones and coreopsis. I’ll likely add more and include some annuals such as cosmos and corn flowers later in the early summer. While I’m mainly after cut flowers, I can’t possibly use everything and the excess flowers will left to attract bees and other pollinators. We did have an enormous comfrey plant in one bed, which did an amazing job attracting bees. Sadly, it also did a stupendous job at protecting and feeding hundreds of slugs. So I’ve dug it out and will replace it with something else. As I’ve also ordered some summer bulbs of dahlias and species lilies, which will need to be planted soon, they likely take up that space happily.